I believed Jon when he told me this many years ago, and after a decade of playing against and with the best players in the world I believe it even more now. Even in the first few months of my forehand, Jon pushed me to learn to throw in a way that would function in any offense, with any receiver, and to be comfortable in a style of play that didn’t currently exist. There is always another trick, or another way of seeing the field, and your throwing skills can be improved in a way that works broadly. We both saw the devil in the details. Players around us, at all levels, were training to throw in ways that were extremely specific for their position, throwing ability, or the places that they normally touched the disc on their current teams. It makes sense: most throwing teachers were simply older players that were trying to create a game-ready team in as few steps as possible. Some of them had seen higher levels of the game. Others had not. Very few of them had asked to be put in a position to educate large hordes of young throwers. At the same time, the first year or two of throwing is when the basic habits are introduced that will largely define a throwing style for a player’s lifetime. For example: many players I knew were taught that one must always pivot as far and low as possible on each throw. This massive oversimplification is taken as gospel by rookies, who don’t always have the experience to observe what is obvious to many: very few throws in high-level games are made on a full, low pivot. The best throwers, with some very notable exceptions, are often those throwers that can use their skill and fakes to avoid low, over-committed positions. This well-intentioned-but-limiting advice is the result of putting semi-experienced players in charge. And bless them, because their efforts are far better than nothing. But this type of advice does not make for great thrower development. Some people were lucky enough to have role models that were imaginative or high-level players. In Jon, I had both. I’ve been fortunate enough to coach many players in the years since then. As most of them will probably tell you, I am likely to suggest different and varied methods of practice. I’ll almost never ask a player to spend more time throwing a very particular throw or with a very specific form. For my own game, I’ve always found that versatility and balance are keys to winning games at many levels and in many conditions. The Zen Throwing routine is a combination of a group of exercises that I have found to help develop my own balance and versatility in throwing. I was inspired to put this into a cohesive form as a partner-slash-alternative to Lou Burruss‘ Kung Fu Throwing, which is a very effective plan with very different goals. For me, balance is another way of saying “what I can do”. If my footwork is balanced, I can throw on either side. If handwork is balanced, I can throw quickly or powerfully. If my skills are balanced, I can catch as consistently and creatively as I can throw. If my mentality is balanced, I can throw in the best of situations and also in the worst. That’s probably enough theory. I’ll just end by saying that no routine or doctrine can ever take the place of the most fundamental throwing skill. That skill is in making every practice throw as game-like as possible, both mentally and physically. If I am throwing with a stationary receiver, it can be hard for me to hold a serious conversation. Why? On every throw, I am imagining a different and realistic receiver who just happens to catch the disc at the exact spot my partner is standing on. They may not see them, but I see receivers going deep, cutting in, standing poached, tripping and getting back up. I see wide open swings and stall-9 blanketed runners. I see some of their jerseys whipping in the wind, some of their cleats clogged with mud, and others surrounded by a stadium’s worth of screaming fans. Sometimes I throw in spite of my completely imagined injuries, and other times I can actually conjure and feel the awful pit-monster of fear and nervousness in my stomach. Do you get 10 chances in a row to throw a hammer in a game? If not, then don’t practice 10 hammers in a row. 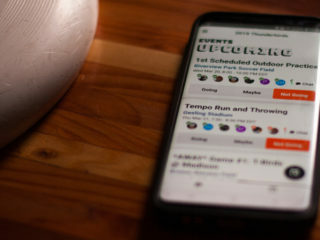 For your basic throwing, create an organic mixture of the types of throws and situations you’ll see on the field. This is what Anders Eriksson called ‘deliberate practice’, and I think that 5 minutes of that kind of variable and focused throwing is more valuable than a full hour of simply propelling a Discraft through the air. For each exercise, use a mix of forehands and backhands primarily, with your game-like mix of other throws sprinkled in. Unless stated specifically, throw at a distance between 10-30 yards (or, better said, at a distance that you can expect to be able to complete at least 1/2 of the throws). A good Zen routine probably includes roughly half of these exercises, and is ~20 minutes long when very focused. Once you’ve tried them all, use the exercises that work for you and ignore the ones that are boring or don’t seem to be necessary. When you are having specific throwing issues, you might come back to those at some point. The order presented below is a general order for this very long full routine, but can be adjusted. I’ve intentionally kept the times short, because I strongly feel that throwing skills is best developed by throwing every day. How many days off of shooting a basketball do you think Steve Nash takes every year? My throws are at their best when I have 20 days or more in a row behind me. Throwing for 10-20 minutes every day is doable while an hour of throwing each day is probably not (and probably not safe for your elbow ligaments). As always, I haven’t dumbed anything down. This is exactly what I use to train my throws, and I teach the same skills (often at different rates) to beginning as well as elite players. Editor’s note: to aid in the visualization of these exercises, we have embedded Ultimate Rob’s Zen Throwing walkthrough on YouTube. See also this Google Doc from John Henkel with a printable version. Description: Catch on the side of the disc spinning towards you. Upper-level: Catch on the reverse side. Goal: Increase hand quickness and reading the spin of the disc. 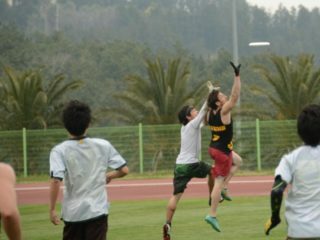 All players progress, at some point, to a realization that there is often an optimum side of the disc to catch (the one that is spinning into, not out of, your hand). Some players realize this unconsciously. Make this conscious and practice it. For example, if a right-handed player throws a forehand, you will want to catch on the left side (from your vantage point) of the approaching disc. Description: Pull back your throw to the farthest point that you normally reach. STOP. Moving only your head, turn and look at the angle of the disc. Only moving your wrist, adjust the angle of the disc to be as flat as possible. STOP. Move your head only until you can refocus on your partner. Throw. Goal: Eliminate the 3-dimensional battle against the disc by ensuring that you bring it back flat. Any tilt to the disc in the windup, no matter how much it looks cool, is just another complication that your throwing motion needs to fix. Minimize it as much as comfortable. Description: While stepping to throw your backhand, have your partner hold up a number of fingers on the hand that is farther from your backhand side. Call out the number before you throw. Goal: Backhands are often problematic in games because good bio-mechanics tend to pull your eyes away from the target. We need to accept slightly shorter throws that allow us to see the field with both eyes, or else risk the field changing after we have made a decision. Description: While receiving, blink eyes as rapidly as possible. Goal: Hone catching anticipation and reflexes by removing roughly 50% of the information that your eyes receive to simulate the coordination needed to catch while running, distracted or in traffic. Description: Wind up any throw. When you get to the point of the throw at which you will only go forward, stop. Hold for 5-6 full seconds, counting out loud. When you reach that time, throw in a forward motion (in other words, don’t wind it up more). Goal: First goal is to develop patience. Just because you have a throw ready does not mean it is the correct time to throw, and your opportunity may improve by waiting (even if your body is flying through the air or the stall is high, you can be physically calm). The second goal is to learn to throw without being tied to your windup. This allows a great versatility of timing. We all know examples of people that can only throw when they include their usual windup as part of the throw. This is all mental. Those people are preyed upon by poaching defenders and quick marks. Break the habit of your early tell and your windup crutch. Description: Throw straight blades to your partner, aiming for their collar bone. Try to throw high enough that the disc leaves your field of vision. Throw with wrist power as much as possible (no step). Upper-level: Catch on the top (trailing edge) of the disc. Goal: Develop forehand/hammer strength by forcing coordinator of abs and wrist instead of leg. Work on catching quickness and develop confidence catching high throws one-handed. Description: Balance on opposite leg from throwing hand, throwing either forehands or backhands. If you complete a throw, back up a step. If your partner needs to move to catch, step closer. Do forehands first (generally flat) until you get to a good working distance where you don’t gradually step closer or farther much. Once you’ve tried this during a couple of sessions, this corresponds very well to your effective accurate throwing range in games, by the way. Upper-level: Stay balanced for 3-4 throws at a time, including the catch. Very upper-level: Use fakes without losing balance. Goal: Smooth out the long-throwing motion by eliminating body torque and legs. Improve power from core. Description: Place feet shoulder width apart. Throw backhands, starting with low and very inside-out (disc nearly vertical). For each backhand, throw from a slightly raised angle continuing until you are throwing a nearly vertical disc from a high position. Try to locate each throw to the same region of your partner’s torso. Repeat with forehands. Imagine Leonardo’s human physiology sketches, but with a disc in each hand. Upper level: Repeat the Arc, but with the disc flat for each throw (this will require changing grips). Goal: Develop comfortability, accuracy and strength in small angle changes without compensating with legs or power. Description: Pick a throw that you cannot currently throw well (this could be a scoober, or an inside-out forehand, or a high-release push pass…something that you are not currently comfortable with but that you think could have value). Throw this repeatedly. Description: At any distance, throw hard. Goal: Three goals here, and very effective when used in moderation. The first goal is to smooth out longer throw mechanics. These ‘hitches’ will sometimes solve themselves when your body is moving too quickly for them to be included. A second goal is to be confident with a fast disc. This is a great example of where it might be better to drop a few difficult catches in practice rather than snagging 100% of the easy throws. Challenge yourself, and you’ll find that you are better in disc-shaking wind and reactionary catches (and the throws that follow them more calmly). Description: Catch each throw with as little noise as possible, even when throwing hard. It may help to extend arms and catch while pulling them back towards your body. Upper-level: Do this while moving toward the thrower. Description: Straddle a line while throwing with your partner. Just before catching, move your feet so that you are ‘in’ on one side of the line. Upper-level: try to be ‘in’ on the far side of the line of the disc. Very upper-level: Choose, during the throw, the side on which your partner should try to be ‘in’. Goal: Develop familiarity with close-to-the-line throws. See Parinella, Rifkin or Ziperstein for great examples of expert line catchers. Description: Partner puts up a one-hand target. Try to hit that target. If you can’t hit it perfectly, try to make your misses be farther away from the hand on a line from the targets heart. Goal: Simulate throwing to a smaller target to increase accuracy. Also, be ready to throw to the non-guarded side of a player (keeping the disc a bit farther from the defender). Description: Throw to a partner that is standing either eyes-closed or facing away from you. About a third of the way through the flight of the disc, say ‘Now’ so that your partner can find the disc quickly and catch it. Upper-level: Give progressively less time to find the disc each throw. Goal: Develop quick reading ability for a disc in flight, and quick hand reaction time. Description: Wind-up for each throw as if you were throwing absolutely as hard and far as you can. Throw only 10 yards or so, trying to throw smoothly and without flutter even though your body is propelling. Goal: Test and improve the efficiency and smoothness of your release by combining maximum movement (a hard windup) with a minimally stabilized disc (at slow speed). Description: At a longer-than-normal distance, catch and throw as quickly as possible. Upper-level: As you are catching, have your partner yell out ‘Backhand’ or ‘Forehand’ so that you are reacting to needs of the situation and not just throwing the easiest throw to get to. Goal: Develop long throws in a game-like way by forcing quickness. This removes parts of your normal huck motion that are not quick enough to be game-usable, but that contribute to throwing long distances by increasing total power at the expense of reaction time. Remember: Short/early hucks are often caught. Long/late hucks are often turnovers. Description: At any distance, try to throw with touch (high spin to speed ratio) throws that will land very close to your partner’s feet. 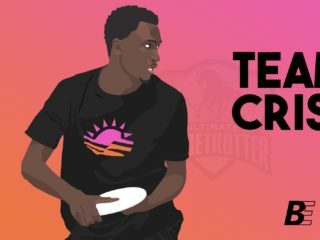 Upper-level: Try to throw with enough touch that you can bring your partner to move from where their feet are planted to catch your throw as it settles just annoyingly out of their reach. Goal: Perfecting touch throws (especially hucks) by controlling the tilt of the disc at the end of the throw, which has a great deal of influence on the final location of the throw. If you are throwing discs that don’t have a controlled tilt, you will tend to have them fall very far away from your target. If you master this, your receiver will have a difficult time reading whether the disc will fall straight to them to decay in its path and fall annoyingly far away. Description: With the disc in your off hand, do some even-out work by pivoting deep, low, powerfully and quickly on your non-throwing leg. Alternatively, try 3-4 sets of 12-16 pivots. This can be by throwing stretchy off-hand throw (more fun) or by doing a minute-long set of off-leg pivots (harder, and more necessary if you are throwing a lot). Goal: During any throwing session, you are likely to pivot many more times on your throwing leg than on your non-throwing leg. This can have bad ramifications for injuries (right leg IT band tightness, anyone) and for your running form. You can help this by evening out the distribution of strength and work. Description: From <2 yards apart, very short throws from a variety of angles including push passes, forehands, and backhands. Don’t forget your left hand. Upper-level: Throw each throw in the same grip that you catch with. Alternatively, increase the speed. Goal: Create catchable throws for the short game and become comfortable with the eye-head movements that are extra and required only for short following short throws that change your vertical visual plane more. Description: On each catch, look the disc all the way into your hands and pause until your eyes refocus on the disc (usually on some specific detail like the flight rings or a part of printed logo). Don’t move to throw until you have completely focused (1-2 seconds). Goal: Remind your body by overemphasis that it needs to watch the disc as far into your hands as possible. In reality, the optimum is probably to look the disc almost all of the way into your hands, and it will actually leave your vision for the last foot or two. During a season, you’ll gradually start to loose disc vision farther and farther from your body (just by natural familiarization with so many throws and catches) and this helps reset to a better catching state.